Hi! On the site you can find some service, reviews of smartphones, repair and owner manuals for repair and maintenance of your mobile phone online. Also you can free download all these users guide! These materials are for personal use only. Thank you for visiting the site. Admin. Acer - Taiwan-based company for production of computer equipment and electronics. The company occupies 487 place in the Fortune Global 500 (2011). In 1976, Stan Shih founded Multitech International. The initial capital of the company amounted to $ 25 000. Initially the company employed 11 people. In 1979 the company built the first Taiwanese computer intended for export. In 1981, the company has created an 8-bit personal computer MicroProfessor-II microprocessor-based MOS Technology 6502. In 1985 the company created the world's first 32-bit PC, ahead of IBM. Opened representative offices in Japan and Germany. In 1987 established company Acer Laboratories Incorporated - a division to develop and produce its own chipsets. In 1988 the whole company was renamed Acer (in Latin, the word means "maple"). There was a major breakthrough for leadership: Acer acquired the US company Counterpoint Computers (San Jose, CA) - at that time a major developer and manufacturer of mini PCs. In 1989, the Dutch company is bought Kangaroo Computer B.V., then became the basis of production capacity AcerEurope units. Acer and Texas Instruments - the leader of the US semiconductor industry - have formed a joint venture for the production of memory chips. In 1990, over $ 94 million Acer acquired Altos Computer Systems, one of the leaders in the production of multi-user systems. In 1991, the engineers Acer ChipUpTM technology was developed, the license for the use of which in 1994 was acquired by Intel. Since 1994, the company is among the top ten PC vendors in the world. In 1997, Acer has introduced a new platform called X Computer. The main purpose - instead of expensive universal machine to present the user with several specialized devices. In 2000, one of the production units have been allocated in the independent company Wistron. In December 2001, Acer announced its allocation of Acer Communications & Multimedia division into a separate company under the name BenQ, Acer in 2006 sold his shares of BenQ. In 2007, Acer acquires in its membership eMachines, which is sold as a separate brand. In 2007, Acer acquires Gateway and Packard Bell. In March 2008, it announced that Acer bought the company E-Ten Information Systems (manufacturer of the Glofiish smartphones, which gained wide popularity in Russia and Ukraine). The acquisition was completed in the III quarter of 2008. The amount of the transaction is estimated at $ 290 million. In February 2009, at the Mobile World Congress in Barcelona, the company introduced its first PDA product line (the company calls smartphone devices) produced resources of the company E-TEN. The latter is clearly evidenced by two model line - Acer DX900, which went on sale in Russia in December 2008 under the name Glofiish DX900 and Acer X960, which is the usual restyling of the original model glofiish X900. Acer company develops and manufactures monitors, hubs, communicators, disk drives, network cards, desktops, keyboards, memory, laptops, projectors, etc. Etc. Operating profit, $ mln ? 310.17 ? ? ? 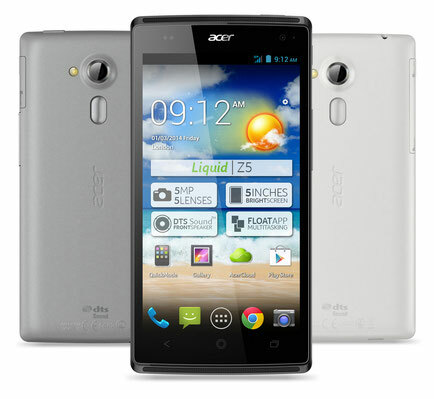 Acer Liquid: Acer Liquid Z630 (review), Liquid Z110,Liquid S100, Liquid E, Liquid MT S120, Liquid Mini E310, Liquid Express E320, Liquid Gallant Duo E350, Liquid Z120 DUO, Liquid Z150, Acer Liquid E700, Acer Liquid Zest 4G (review).